A stunning smile makes a great impression no matter what your age. If you are self-conscious when chewing or speaking due to missing teeth, dentures in Goshen may be a solution. Our affordable quality dentures are discreet and durable, and they are available in several different styles and types. The procedure for obtaining new dentures takes place over many steps. At an initial visit, your dentist will record measurements and take impressions of your mouth to ensure your device fits properly. When receiving a full denture, all teeth in the affected area must be removed before a denture is set in place. Your dentist may give you a short-term device to wear while your mouth recuperates from the preliminary treatment. If an implant-supported denture is selected, dental implants will be positioned in your gums before your permanent device is created. When your mouth is fully healed, the dentist will affix your permanent denture and make any needed adjustments. Dentures are available in an array of styles to meet your needs. 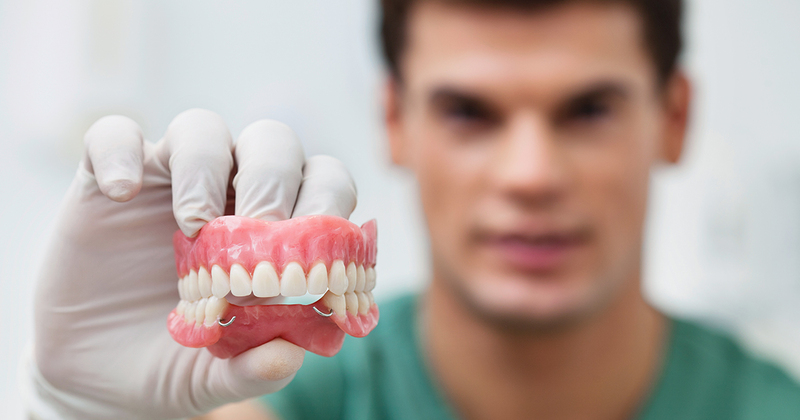 Here are some of the options for affordable quality dentures that you’ll find at our office. When you are missing the majority of your teeth, a complete denture may be an effective treatment option. Also known as a full denture, a complete denture replaces an entire row of teeth. These durable appliances are composed of acrylic, porcelain, and other materials. They can be removable or fixed into place using dental implants. Complete dentures must be removed every night for cleaning. If you still have several teeth in good condition, your dentist may recommend a partial denture. Partials can be used to replace one or multiple teeth and function similarly to a bridge. Clasps on either side of adjacent teeth are used to hold the denture in place. Like a complete denture, you will remove the partial every evening for cleaning. Made with comfortable, pliable materials, flexible partials offer a discreet way to replace missing teeth. These devices use bendable plastic clasps to hold the partial in place, creating a natural look. The denture moves as you chew and speak, allowing you to wear it with confidence. If you desire to restore your smile without the use of denture adhesive, an implant-supported denture may be an option for you. These appliances are affixed to the mouth using one or more pairs of dental implants. Implant-supported dentures offer a stable hold and increased comfort, and they’re typically recommended as lower dentures. How Much Will Dentures from Your Office Cost? Like most personalized dental procedures, getting dentures in Goshen will vary widely in cost. The cost usually depends on what variety of denture is chosen, what materials are used to create the dentures, and whether your insurance covers treatment. At your initial visit, your dentist will review your estimated charges and provide information about your payment choices. What Is a Denture Dental Device? A denture is a permanent replacement for several missing or damaged teeth and their surrounding tissues. These devices usually consist of a metal framework and a row of artificial teeth. These dental appliances are an affordable, effective way to restore your smile and confidence. Call us now to explore your options. How Does a Soft Denture Reline Work? Soft relines are an excellent way to reduce the frequency of sore spots caused by dentures. During this affordable procedure, the dentist resurfaces the base of the appliance with a soft, pliable material. This treatment usually lasts for up to two years. If your dentures are causing discomfort, call our office to see if a soft reline is right for you. How Do All-on-Four Dentures Work Compared to Regular Dentures? A new approach to restorative dentistry, the All-on-Four denture technique involves placing the appliance on four implants in the bottom jaw. This type of denture provides a stable hold and increased biting capability. If you’d like to learn more about this denture option, please contact our office.